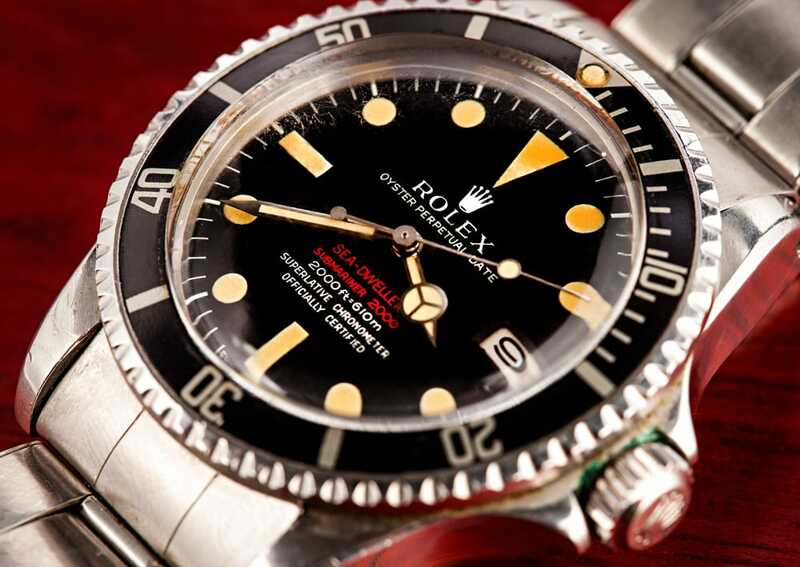 The 1665 Double Red Sea-Dweller. Where are they now? The following article is authored by Ed Delgado. 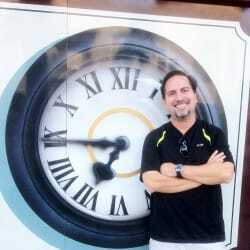 Ed is one of the leading experts in Rolex Double Red Sea Dwellers. In 2004, Ed created DoubleRedSeaDweller.com to help like-minded collectors. Ed is a passionate Rolex watch collector and author. The SeaDweller was born in the 1960s out of the collaboration with COMEX a French deep sea diving company, and the NASA of the deep seas. The new model was called reference 1665 and based out of the existing Submariner model. This was evident since a Submariner’s thin case was used for the early Sea-Dwellers and a Helium Escape Valve (HEV) was added to be able to withstand much larger depth ratings. A Double Red Sea-Dweller the same thin case as the Rolex Submariner. 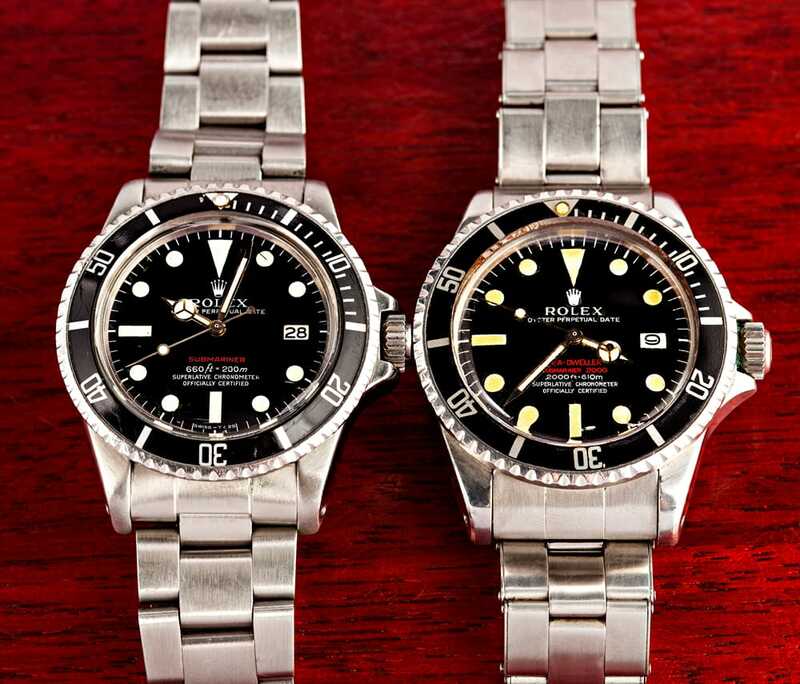 Initial models were issued to DeepSea Explorers of the 1960s in various configurations but in the late 1960 and early 1970s the model made it to the Rolex retail stores. The new Sea-Dweller was based out of a larger case, new domed crystal, HEV, and new dial with two lines of red writing on the dial. SEADWELLER, SUBMARINER 2000, indicating the new watch was based out of the existing Submariner but instead of 660ft of depth, the new watch was rated to over 2000 feet. They usual date cyclopes was also gone with the domed crystal and a case back engraving was also new to this model. A Stainless Steel Double Red Sea-Dweller has two lines of red. 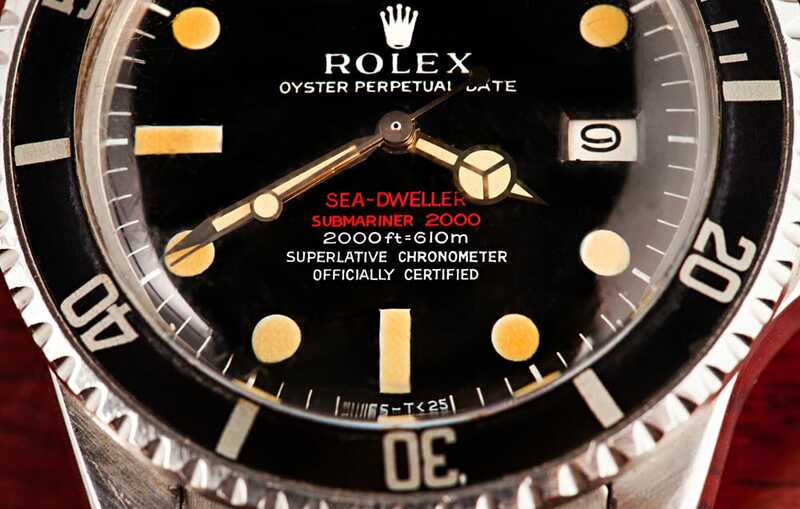 The Double Red SeaDweller (DRSD) was produced for approximately 10 yrs from 1967 to 1977 with serial number range 1.7 to 5.1 million. There were four different dial variations made in the regular production model with three different case back configurations. A Double Red Sea Dweller Watch has a great patina due to the oxidation. 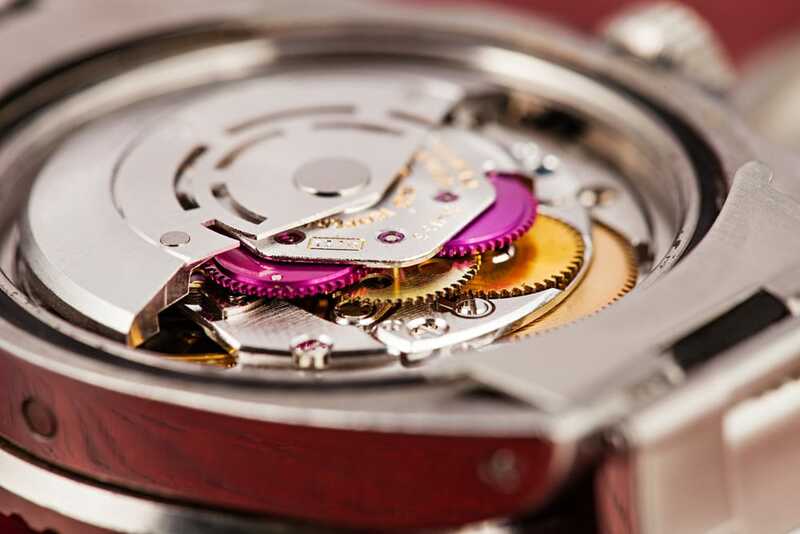 The early version and the most rare is the Mark I dial on a patent pending caseback. These were made in the serial number range of 1.7 to 2.2 million. Mark II dials have also been seen on patent pending models. Patent pending Mark I watches command a pretty significant premium and some have sold for over $100,000.00. Mark II patent pending are also very desirable watches by collectors. The second version of the dial, Mark II, have a different look and some have oxidized and changed the color to a very “chocolate” or “tropical” brownish color. These watches are very attractive and have become very fashionable due to their unusual vintage color of the dial. The mark III and IV dial were the final version in the later production. Mark IV are the most common, followed by mark III, II and the rarest mark I. The DRSD has become iconic for several reasons. The watch is relatively easy to find but finding a nice example with nearly perfect dial and original condition makes it relatively rare. The watch wears very comfortably for everyday use and the beautiful dial with two lines of red makes the dial stand out from most other watches available. Not to mention the watch is relatively indestructible plus tells the date! Lastly, the allure of the vintage look of the domed crystal makes this watch a must have to any vintage watch collector. Pricing of the DRSD has reflected its polarity amongst watch collectors. The bases for a serious Rolex collector, the watch has become an icon. The watch sold for a few hundred dollars in the 1970s and significantly more than the red submariner. In about 2000, they sold in the $5,000.00 range and in the early 2003 was trading in the $8,500.00 range. In the boom of easy money of early 2000’s, and with more knowledge from collectors about the watch, its history and the ease of information available from the internet, the watch took off to an incredible price range. In conclusion. The DRSD will continue to win collectors hearts and mind. The original tool watch with larger dimensions, and attractive dial configuration and writing on the case back will continue to be the cornerstone of most Rolex vintage collections. Rolex has even recognized the this and a Rolex Deep Sea continues to be the desirable brand used by current deep sea explorers and even after its production of the deep sea and the new Sea-Dweller, the DNA of the original Sea-Dweller 1665 remains. Asking prices in a popular internet forum from 2005-2014. Double Red Sea Dweller, mark IV, watch only (no box and papers), asking prices in a popular internet forum from 2005-2014. Note: 2008 was a peak year with the economic boom and asking prices reflected this. Somewhat of bubble pricing. In 2014, there is not enough information to see a pattern but asking prices seem to be increasing. 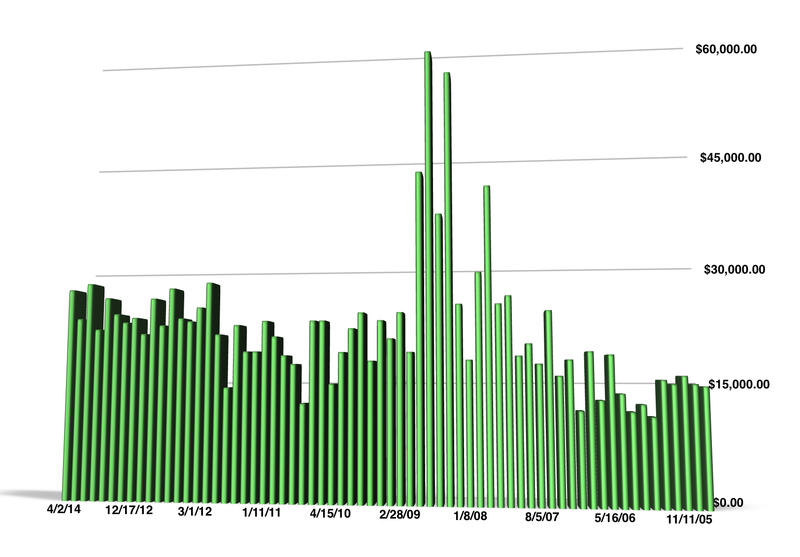 Average asking price per year of Double Red Sea Dweller, mark IV, watch only (no box and papers), asking prices in a popular internet forum from 2005-2014. Note: 2014 only limited number of sales noted.